South Africa was dealt a very tough opening game as they opened against Mozambique on Sunday the 9th of January 2011 at the University of Pretoria. The Zone Six Qualifiers is a round robin format where the team with the most wins and best point difference will represent Zone 6 in the Fiba African Championship for Women to be held in Mali in 2011. The other countries competing for the top spot in Zone 6 are Zambia and Zimbabwe. Lesotho, Swaziland, Botswana, Malawi, and Namibia form part of zone 6 but will not be attending the tournament. Angola will not be playing because they have already qualified for the 2011 African Championships. Tip Off was at 2pm with a fairly good crowd of basketball spectators in attendance to give South Africa full support. Unfortunately for the supporters it was one-way traffic in favour of our neighbour Mozambique who got off to a good start with a 14 point lead after the first quarter. Mozambique was up 26-12 after one period off superior defence and good transition play. 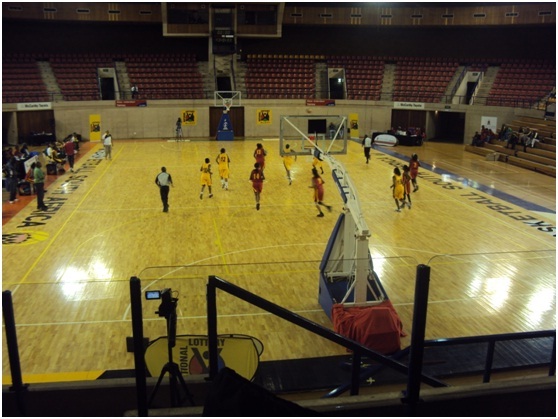 It was much of the same in the 2nd Quarter as Mozambique further asserted their dominance by winning the quarter 23-15. Mozambique’s defence forced South Africa to turn-over the ball excessively. After the first half South Africa had 15 turnovers while Mozambique only had 3. The first half ended with Mozambique leading 49-27. Both teams shot the ball well from the field after 1 half of play with SA with a 50% (9 for 18) field goal shooting percentage and Mozambique with 48% (12 for 25). The difference however came from beyond the new NBA 3 point line. South Africa shot 13% (1 for 8) and Mozambique shot an impressive 50% (5 for 10) from. South Africa also shot a paltry 46% (6 for 13) from the free throw line while Mozambique shot a mediocre 67% (10 for 15). By the end of the 3rd Quarter Mozambique had used a full court press to extend their lead over South Africa to 36. South Africa continued to fold under pressure which resulted in them committing a horrid 29 turnovers as a team while Mozambique had only 9 total turnovers. At one point Mozambique led by 38 points in the fourth Quarter but South Africa managed to make a comeback and eventually only lost the game by 21 points with a final score of 87-56. Takalani Mfamadi finished with the highest point total for South Africa with 15 points, 5 rebounds and 2 steals in 21 minutes of play. Aleia Rachide was the top scorer for Mozambique with 17 points, 7 rebounds, 1 assist and 1 steal in only 14 minutes on the floor. After losing with such a big margin South Africas chances for qualifying after the opener look bleak while Mozambique looks like the favourite to make it through. South Africa’s campaign continues on the Tuesday the 11th of January in the HC De Velliers Indoor Sports Complex at the University of Pretoria when they play against Zambia at 18:00. Mozambique’s next game is also on the 11th of January at 14:00 against Zimbabwe. The University of Pretoria will be the venue for the Zone 6 African Championship Qualifiers for Men and Women from Sunday the 9th of January until Saturday the 15th of January with games starting at 14:00 daily.